Everyone loves just how easy it is to transfer songs to Apple iPods. Whichever kind of iPod you are using, the interface that iTunes offers is so simple and intuitive that even the most technologically challenged people I know do not have many problems filling their iPods up with music, images, and videos. The reverse process – transferring files from an iPod to the computer – is a whole new story, though. I still remember when I got my first iPod (it was the black and red U2 one). I had no inkling about this “issue.” Needless to say, I got frustrated in the beginning. Today, though, this is not really a problem anymore. 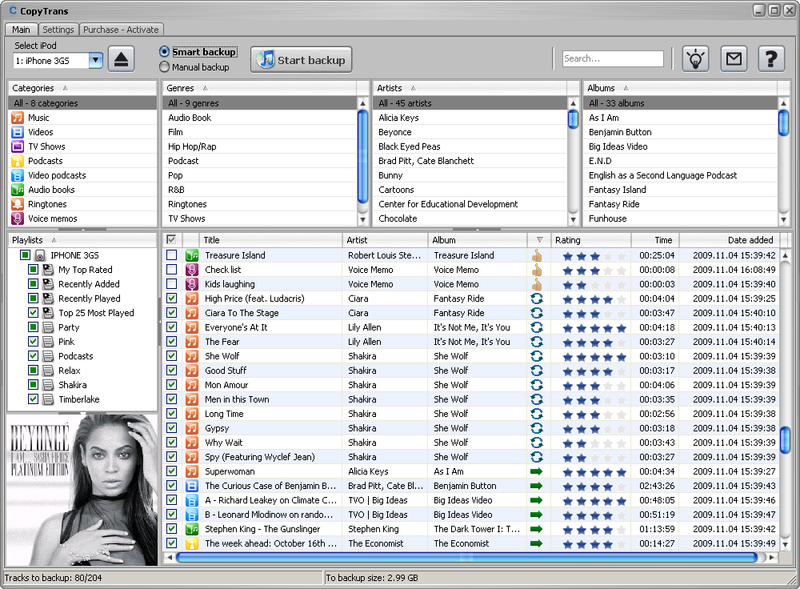 With a single click, you can easily back your iPod up and make sure that its contents are accessible on your computer as well. CopyTrans is a piece of software that can do this for you without you wanting to tear your hair out. There are two modes – Smart Backup and Manual Backup. The first one is highly recommended for beginners. You simply click a button and you can make sure that your iTunes will have everything that your iPod has. It is the perfect choice if you just bought a new laptop (or you reformatted your hard drive) and your iTunes library is empty. It is also an easy way to “fix” your iTunes library if it is missing some songs that are in your iPod. No thinking necessary – just click and CopyTrans will do it for you! The Manual Backup mode is great for more advanced users who want more control over which files to transfer to the computer. However way you want it, CopyTrans can do it for you. No more fussing about how to get those tracks from the iPod onto the computer! Oh, and yes, the newest version is compatible with the new iOS. For a mere $19.99, you get the convenience that you’ve always wanted. I want a copy myself! It is a wonderful post about how to easily backup iPod. Smart backup is very good but I don’t have my money to buy the tool. Can you give me a detailed steps about manual backup?